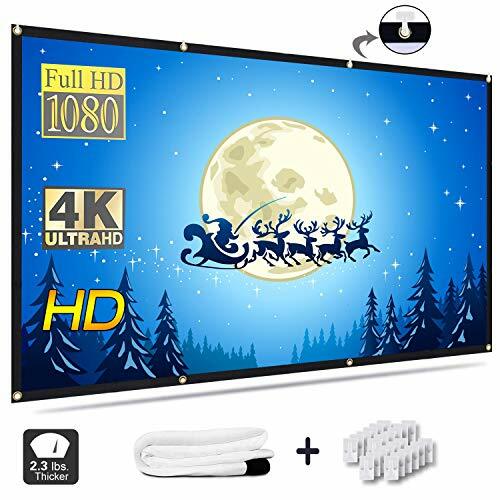 Check out this HOT deal on this 120 inch Projection Screen, VTOSEN 16: 9 HD Foldable Anti-Crease Portable Projector Screen for Home Theater Outdoor Indoor Support Double Sided Projection Priced at only $23.99 was $25.99. CLICK COUPON FOR ADDITIONAL 10% SAVINGS! Ships Free with Amazon Prime! ★ HD projection screens, widely used -16: 9 comfortable screen format, diagonal 160″ Area, in addition, it supports two-sided projection for the eyes to bring the best viewing feast. ★Widely used – ideal for home theater movies, education, conference room presentations, public displays, outdoor movies, etc. ★ No wrinkles, no creases – made of natural polyester fabric, folded or squeezed without wrinkles, making the projection Brighter, smoother and clearer. ★ easy to install and disassemble – the upper and lower ends are reserved for holes. The projection screen can be easily fixed to the wall/bracket by hooks, ropes, brackets, nails and double-sided tape. ★ foldable design for easy carrying and storage – you can fold the screen into small sizes and put it in backpack, suitcase, storage bag. Carry it around and wherever you go.